Annual closure from 31 december 2018 to 1st february 2019. Open daily except for 25 December, and on Thursdays when new exhibitions are being set up : 14 mars, 25 avril, 6 juin, 18 juillet, 29 août, 10 octobre, 21 november. The shop and bookshop areas can be accesses free of charge for all visitors. Annual subscription which allows you free entrance to the exhibitions for a year. Young people aged between 15 and 25, people receiving benefits, job seekers, disabled persons and war victims. From 4pm on days when there are private viewings of exhibitions scheduled. This pass enables you to enter two or three of La Borne’s exhibition spaces associated with ceramics, at a reduced price and depending on their opening times. 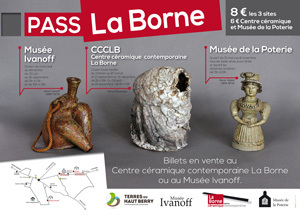 Tickets on sale at the Contemporary Ceramics Centre of La Borne and at the Vassil Ivanoff Museum. Every weekend and on bank holidays during school holidays from Easter to Halloween. The Centre of Contemporary Ceramics of La Borne is located in the village of La Borne (attached to the towns of Henrichemont and Morogues) on the Departmental Road 22. Henrichemont is located 5 Km away from La Borne. We can accept payment by cheque, card and holiday cheques.